We're smack in the middle of Ramadan, the Muslim month of fasting, and I am not ashamed to admit that it's challenging. The not eating all day is tough but the no coffee? Now THAT is the true test. Sometimes, I linger in the kitchen at work when I see someone making a cup of coffee in the hopes that the smell is enough to keep me going. Coffee through osmosis is a thing, y'all! Some (most) days, the only thing that gets me through is planning out my evening meal in great detail. That's sort of a consistent theme from Ramadans past. I'm not talking about a general plan of what I'm going to have for dinner. Oh heck no. I actually make a list of the things I'm going to eat in the order I'm going to eat them. Not a mental list mind you. Not even a iPhone list. Oh no. This is a full on paper and pen list because the act of writing down my food choices on a yellow notepad convinces me that it's really going to happen. Try it, it works. Fasting folks, you can thank me later. And this aforementioned list? There's no rhyme or reason to it. It's part inspiration and part madness because when you haven't eaten all day, your brain goes to all sorts of crazy food places as it gets closer and closer to eating time. Some days, the list looks something like chocolate, Doritos, chocolate, a cheeseburger, chocolate, and more chocolate. Other days, the list just has one word written in rapid succession like coffee, coffee, coffee. When I'm writing that list, I always think of this. Every now and then, something crazy awesome takes form on the list. Take last week for example. There I was, writing my list in painstaking detail as per usual. I started with pizza because really, you can never go wrong with pizza. Then, I added pasta because hello, pasta! I crossed out pizza because I can eat a LOT of pasta and I want to be ready for that. Then I included tater tots because again, helloooo tater tots. Oh, and then butter chicken because obvs. I went back and crossed out tater tots because the babies tend to go nuts around fried potatoes and I'm still trying to instill healthy eating values blah blah blah. So all of a sudden, I'm staring at a list where pasta and butter chicken are sort of next to each other. Weird? Or genius? It was clearly a sign from God and well, who am I to argue with signs, especially in Ramadan? So here you have it, Butter Chicken Pasta. Now for you skeptics, I know butter chicken is normally served on rice so I get your scrunched up facial expression. I too, love me some rice but as soon as I spooned myself a giant serving of this here pasta, I was hooked. The sauce was creamy enough to cling to the noodles and the butter just gave it this lovely richness. Oh and that fantastic char on the tandoori chicken? It's from my very own poor-man's-tandoor or as I affectionately call her, Casty, the cast iron grill pan. And with a few days of Ramadan to go, I hope to spend more time reflecting and less time pining for coffee. But you know I'll still be making them food lists because clearly, I'm at my recipe best when I'm starving! In a Ziploc bag, add the chicken tikka ingredients and marinate in refrigerator overnight. The next day, heat a cast iron skillet (preferably a cast iron grill pan if you want those lovely char lines on your chicken) and add 1 tb. oil. When oil is hot, turn heat to high, add chicken pieces and grill until chicken is cooked about half way (you'll cook the chicken fully in the sauce so you don't want to cook it all the way now). Remove chicken from pan. In a medium sized pot, heat butter until it melts and stops foaming. Turn heat to low and cinnamon, cardamom, and peppercorns. Cook for 3-4 minutes until butter is fragrant. Remove spices from the butter. To the butter, add all the ground spices and tomato paste. Cook for 1-2 minutes until you have a very fragrant paste. You may need to add some of your water at this point to prevent the paste from burning. Pour in the cream in 1/4 cup increments, mixing after each addition. Add the chicken. Cook on low heat for a few minutes until the chicken is cooked completely. While you're cooking the butter chicken, in a separate pot, boil water and cook spaghetti. 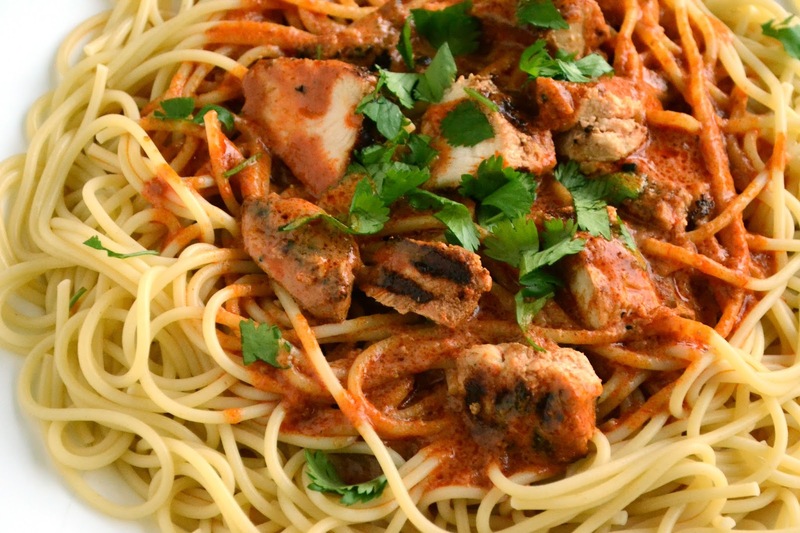 Drain spaghetti, top with butter chicken, and devour. Pat your list-making self on the back. I would totally be making a list, too. And this dinner would definitely be on it!! We've had it twice this week with no signs of quitting! i know what you mean by writing that list down..but my problem i lose that list too often. and im all up for butter chicken pasta. Wait, butter chicken poutine is a thing?! If not, please please make it an actual thing. You'd be a bazillionaire but more importantly, you'd be so full and happy! Thanks! I love rice but a break from it was really nice! This sounds and looks so amazing!! Oh man - I get why the list works but I feel like it would make it a million times more frustrating that I couldn't be eating it RIGHT that second! I trust you though :). I really do love reading your posts! : ) You make me laugh and I can so relate to you. First of all, I am totally going to have my next butter chicken dish with pasta! It makes total sense - why not! I just made semi-homemade chicken tikka masala last night for dinner and served it with rice; of course, now wishing I had it with pasta. And I am always in awe of my friends who fast for Ramadan - it is HOT! And when I am hungry, I also love to think about all the things I'd eat in my dream "buffet", if you will. Making a list is even better and totally the perfect way to get through the day. Take care! Hooray for semi-homemade! I confess that most of our meals, especially during the week, are semi-homemade. But for what it's worth, this one is just as quick and super delicious! I use a yellow pad too! always lose my list or cannot find it until I leave the grocery store, love this dish, looks amazing!!! I can't figure out if the yellow pad is archaic or quirky but I'm glad you're on the notebook train too! Thanks Kelly! I'm not sure if it was great or desperate but it worked! I used to LOVE butter chicken..and then I stopped eating meat. :( Such a great idea! Butter chicken and Pasta! You r a genius, this look delicious and I am so gonna make this for my iftar soon! Or Eid for that matter :D. Hope the fasting is going well, I feel for you , fasting in summer!! Happy almost-Eid friend! I hope you guys have a great day (with great food) planned! By living in the Middle East I admire the Muslims for fastening all day. I cant even imagine how hard it must be. Only four days to go. This looks like an amazing dinner idea! Yum!! Thanks a bunch, it was pretty tasty! Just Yum!!! I need to make this asap! Morning coffee is like the nectar of the Gods for me...No morning is complete without it. So, I feel your pain. 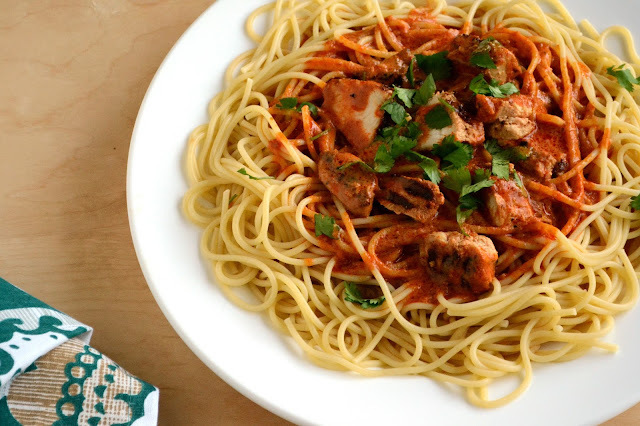 This butter chicken over pasta looks really good. A great dish borne from creative hunger.